These old-time pecan pralines are from an old recipe book of the Godchaux Sugar Refinery, an old company in New Orleans, Louisiana, printed approximately 1879. In a large, heavy pot combine sugar, brown sugar and water; bring to a boil. When sugar is dissolved, add pecans. Reduce heat and gently simmer, uncovered, stirring occasionally. Cook for "about 15 to 20 minutes, until the mixture grains when metal spoon is rubbed against side of pot" (direct quote from original copy). Remove from heat. Add butter and vanilla. Beat mixture with wooden spoon until it appears to granulate and adhere to the spoon. Drop by spoonfuls onto waxed paper or foil. Cool completely. Note: This is what pralines really tasted like in the 1800's. 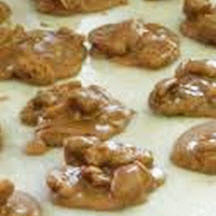 Most of today's pralines have milk in the recipe and are not authentic in taste. If candy does not set, return to pot and cook longer. If is hardens before you can drop it, add a little more water and bring to a simmer.